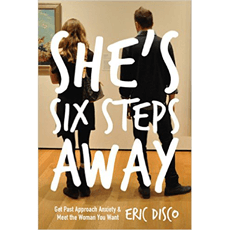 "She's Six Steps Away" teaches you how to get past your approach anxiety in order to approach and talk to women you are interested in. It is designed to give you clarity on why you’re taking each step. It also progresses you to incrementally more challenging situations at your own pace. Each step consists of exercises to improve your confidence around women without feeling desperate or using manipulative lines. The book also shows you how to meet women in a variety of situations and connect on a deep level. "An absolute must read for anyone looking to meet new people! " I read this book last night and I think it is an absolute master-piece! In fact, I’d honeslty go as far saying it is the best book on dating/seduction that I have ever read. I spent 4 years in the seduction community and during that period, I read most of the books/e-books in the field of seduction. I have attended numerous seminars and I have met and worked with lots of seduction experts. Most important of all, though, I spent hours every week on the streets, in coffee shops, in supermarkets etc approaching and starting conversations with women. So I know a lot about the challenges and obstacles that guys face in this mission. This book is so good because it breaks down the whole process from absolute beginner to a guy who is comfortable meeting and talking to strangers, and it does it in easy to follow, step-by-step instructions. At each stage of the process, it describes exactly what the guy needs do, and how to do it. Eric has also explained why the step is necessary. Best of all, he gives real-life examples of interactions. If that wasn’t enough, he even gives material in the form of suggested questions and statements so the guy doesn’t even need to think up what to say! Genius!! No guy who has this book has any excuse to fail! When I read this book, it showed me what I had been doing wrong when I was approaching women, and how I could have improved my results. I think if I had read this book 5 years ago, I would have had a lot more success than I did have. The structure of the book is also really good. Eric tackles each issue (e.g., approach anxiety, direct game etc) at the exact right time. All in all though, I think Eric has written an amazing book. There will be many people in the future who owe their lives (literally) to Eric, because his book will have given their dad the encouragement and skills to be able to approach their mum and get a date!!! "A systematic approach that definitely works"
This system works. My only complaint is that it's almost too easy. It requires fairly little intensity of effort, but it does require a little bit of effort spread over a long period of time. The reason for this is that Disco wants you to form life-long habits that stick. You can't solve this with "book-learning"... it requires repetition. It's like training for muscle memory; you know how athletes train so that they can react and respond during the game without thinking? That's pretty much what this program seeks to do; to train you to move your feet and interact when you FEEL attraction, without thinking. The thing that stops you from approaching is your emotions... it's not that you don't know how, it's the feeling that stops you. It's called inhibition, and Disco takes you through a bunch of baby-steps that allows you to gradually acclimate yourself to that emotion so that it eventually becomes manageable. This was a breakthrough for me; I seem to have been born with (or maybe taught ... maybe both) a high level of inhibition. For instance, I used to be really scared of heights but after doing a lot of hikes and exposing myself to that emotion little by little without freaking myself out, I'm able to do some really awesome hikes. Where there used to be fear there is now excitement and exhilaration. This program is similar. It starts with fairly easy exercises which give you small doses of that inhibition/fear on a daily basis. By following the program you keep the fear within a tolerable zone while moving towards being a guy who simply interacts with anyone he finds attractive. The thing I love about this program is that it allows you to be yourself! It doesn't ask you to dress a certain way, or say certain things... it simply has one purpose, and that is to enable you to get over your fear and hesitation/inhibition. It actually helps you align your actions with your thoughts and emotions (you feel attraction you go towards the thing which is attracting you... makes sense, yeah?) Ghandi said "happiness is when what you think, what you say, and what you do are in harmony." If that's true then sadness/suffering must be when what you think, say and do are out of sync... and isn't that what approach anxiety is? You are attracted to something but you don't act on it? It's a terrible feeling and there's no excuse for subjecting yourself to that suffering when there are ways to alleviate it. This may seem like an overly glowy review, but whatever, I really do think this is a brilliant system. Approach anxiety (inhibition) has been such a huge monkey on my back for so long, and by following this system my life is changing. It's like having a big stupid tumor removed. Just make sure you are willing to devote about an hour or so a day to it, and make sure you have a place to go where there are attractive women every day. Hope you're good and everything is going well with the release of your book. I just finished it... it's really something to be proud of! My comments should be filtered by the acknowledgement that I haven't tried to put your system into action. I really want to. I tell myself that I will... but I'm still making excuses. I feel close though. I think you've created something brilliantly designed for a certain type of personality -- and I feel that's why I respond so well to it. It's almost impossible to describe to a 'natural' what it feels like to be shy or inhibited around women. To them it sounds stupid. See girl --> get girl. Over time you come to feel stupid for it... asking yourself how you ended up this way. Who's fault is it? You grow bitter and resentful of women. It's a painful cycle that just feeds itself until you decide to do something about it. The biggest insight for me was the notion of your body acting on its own behalf -- and generally contrary to what you really want. I know very well what this feels like -- locking up in front of a beautiful woman who shows you just the slightest bit of attention. The idea that I might be able to 'train' my body to overcome this, through gradual conditioning, is revolutionary (for me). I also really like that your whole system can exist independent of all the misogyny present in the community. I read blogs like Roosh's, VK... and while there's clearly a lot of wisdom there, I can't see how all that hatred is realistic in the long run. You never make the woman out to be an object... instead allowing them to be the real, complex, human beings that they are. I could go on and on, but I feel like that may not be the best kind of feedback. I wish I could say I'd gone through the steps. The thought of step 3 gives me the spooks, but 1 and 2 seem manageable. I'm very excited to try it out... and I'm sure each chapter will display its true value as I progress through it. It's tough -- you just want someone to come and solve all your problems for you but deep down you know that you have to do it yourself. Of all the books, blogs, and videos I've seen, your book comes the closest to bridging that gap. Thanks so much for creating and sharing this! This book is excellent for beginners. It is very easy to understand and very motivating. It covers everything a total beginner and a guy who is comfortable to talking to strangers needs to know. It also breaks down the process in 6 "mini" steps making everything easier. Moreover there are segments where Eric covers comon mistakes guys do which helped me a lot I have to say. The situation examples are very helpfull to.In that way you get an idea of what your conversation is going to look like. If you're a beginner and you want to get into the game, this book is all you need. A 10/10 for me! "Great product for guys who can't start conversations with women from someone who isn't a natural." It’s refreshing to read a dating book from someone who’s gone through social anxiety like I have and know how terrifying it can be to approach women you don’t know before. Eric Disco breaks down the process of approaching women into manageable steps instead of saying just follow the three second rule and you’ll be okay. I also like how the openers from the book are similar to normal everyday conversations you have with people all the time and don’t feel awkward to say. This book has a lot of applicable information you can use and clear directions about how to implement what you read into real life. I think Disco really tackled this issue head on and provided a great resource for guys who can’t even do one approach and aren’t having any luck with the more advanced dating products out there. Finally, I think the audio interactions and interviews included with the book are excellent bonuses and well worth the price.